Fifth Generation iPods and 2nd generation Nano’s attached directly to the built in dock, which transfer MP3s directly from the turntable at either 33 1/3 or 45 rpm. You can still attach to your PC if you want to clean up the recordings and get rid of the hisses, pops and scratches, but most people like the retro sound of albums. 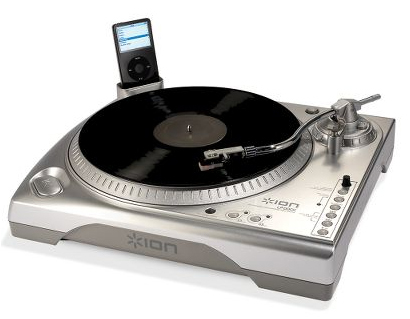 And with the convenience of their iPods, who isn’t going to trade in their turntable for one of these babies? Hammacher has it for about $260. Now, if they’d only go into video, they could rule the world. The Edirol R-09 will produce MP3 files from *any* source, without having to buy multiple devices, although I mostly use it for music practice.